Learn how to use needle threaders for hand sewing to make getting started so much easier. If you hand sew, then you are no stranger to the trouble of threading a needle. Struggle no more! Once you learn How to Use a Needle Threader, you will have the needle threaded in no time. This page will outline the basics of needle threaders and then provide a tutorial for using one. If your needle eye of large, then you may not need a needle threader tool but otherwise, this sewing notion is a must-have. A simple needle threader is inexpensive, which is why every sewist should own one. This reference page and tutorial is perfect for beginner sewists, but everyone could use a refresher in threading needles with this tool. Once you start using a needle threader, you will wonder how you ever got along without one. But, first, you need to learn how to use it. There are many different types of needle threaders, including automatic, plastic, and metal threaders. You will also find needle threaders for use with yarn instead of thread. There are needle threaders with special accents, such as lights and scissors, too. The most common needle threader is the metal, which is what we will be using for the tutorial. However, we will touch upon using the others as well. Check out the tutorial below and follow the simple steps to thread your needle. Visual learners! Watch this video above to see how to use a needle threader and then follow along with the directions below. What is a Needle Threader? If you aren't familiar with this sewing notion, start here. A needle threader is a small handled tool that has a loop of thin wire. However, as mentioned earlier, there is more than one type of threader. Sometimes the handles are metal, like the two shown in the image below, and sometimes they are plastic as the third threader shown in the image below. As you can see, the metal threaders have only one loop. Plastic handled threaders can also have one loop or they can be like the one shown in the image. The three threader tool has the thin wire for thread, a small hook for light and medium weight yarn, and a larger hook for medium or heavy weight yarn. The size of the needle is incredibly important when using a needle threader. The reason the wire is so thin is that it's flexible enough to fit through tiny eyes. But, there are some so small that no threader can fit. The yarn hooks can only be used with large sewing needles or yarn needles. It's a good idea to make sure your threader can go in and out of the needle eye before attempting to thread your needle. It's rare, but sometimes they get stuck. There are also electronic, automatic needle threaders that you can buy to do it for you. Those are more expensive than the manual versions but it may come in handy if you don't have nimble fingers or need to work fast. First, assure that both your thread and needle threader will fit through the eye of the needle. If you are unsure of which needle to use for your project, take a look at our page on Sewing Needle Types. Because there are so many types of needle, it's important to choose the best one for your fabric. 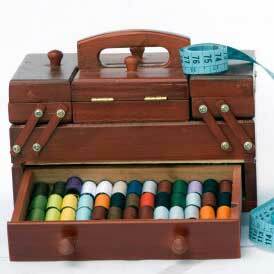 If you want to make sure you are using the correct thread, take a look at What Types of Thread to Use: A Sewing Guide. If they all work, then move on to the next step. Cut the thread to the appropriate length for what you need (twice the length you think you will use). Note: Some projects may need more thread than you will have on your needle at one time, but, remember, you have to pull the thread through entirely for each stitch when hand sewing. Don't cut more thread than you want to pull through at once as it will take longer for you to work and there are more chances it will knot unexpectedly, causing you to start over anyway. You can always tie off your thread and start fresh at the new stitch. Take your cut thread and push it through your needle threader loop. Pull it about a quarter-to-halfway through. Push the eye of the needle over the loop of the threader. Note: You will want to move the needle past the thread that's around the loop. To do this, you may need to hold the thread pieces on either side of the wire tightly as you push the needle over. On some needle threaders, like the one used in this tutorial, you can push the needle past the wire loop and over the metal piece, which makes it easier to grab the thread in the next step. The second image below shows this. Carefully pull one end of the thread through the eye of the needle (while still on the needle threader). Once your thread is through the needle, remove the needle from the needle threader. Adjust the thread length on either side as needed. Tie a knot at one end and you are ready to sew! Download a handy infographic version here! It seems simple but seeing it in visual steps does help a lot. This tutorial is so helpful! I was given a needle threader by my aunt, but I've never actually used it. Thanks so much.